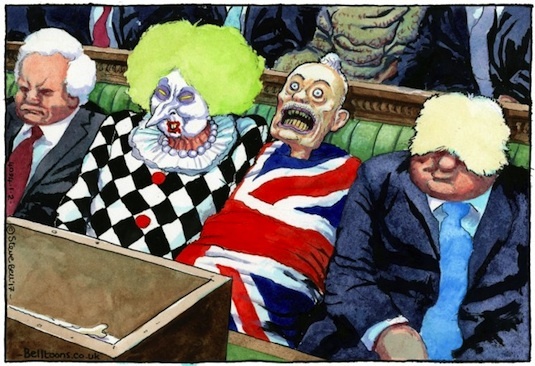 Will There Be a Tory Leadership Challenge? War is hell. Unless we're seeing Tory rising against Tory, then it's entertainment. And what an entertaining weekend it has been. "Call Me" Philip Hammond stirred a hornets' nest by simply setting out the government's current positioning on Brexit. That Britain is looking at continued close alignment with the European Union after Brexit is, of course, the most sensible course of action to take provided you don't want to tank the economy. And yet this position, which is more or less remaining in the Customs Union without it being called 'staying in the Customs Union', has been the case since early December. Why then are the Brexiters hopping mad and calling for blood, why the theatrics from Jacob Rees-Mogg followed by Number 10 putting distance between itself and the chancellor's remarks, even though he was reiterating the government's stance? Why was the idiot Gavin Williamson transparently on manoeuvres this weekend, and talk of a leadership challenge is abroad once again? I guess we're seeing movement precisely because there has been no movement. The Prime Minister is precariously balanced because those who would be king, and at this point a man is most likely to succeed her, are all balanced out too. We're not in a position for a winner to swoop in and draw the party behind him, just like one Theresa May managed 18 months ago. Hence what we get is permanent instability, a period of balance and wobble and one most politics watchers are entirely unaccustomed to observing. Emboldened by 1922 Committee rumours, Rees-Mogg chose the occasion of Hammond's speech - who he detests anyway for having one foot planted in economic realities - to remind the Prime Minister of her stupid rhetoric near the beginnings of her premiership. No deal being better than a bad deal is exactly the programme of his magically-funded European Research Group, the shadowy organisation set up by hard right fool and, as it turns out, self-styled Crowleyite Dan Hannan. Their central objective is cutting loose entirely from the EU so the UK can double down as the world's number one destination for tax dodgers and money launderers, a pathetic and intellectually dismal project that would spell ruin for millions of people but entirely coincidentally line the pockets of Rees-Mogg and his like. His firepower, if it can be characterised as such, is less a challenge and more a shot across the bows. He knows as well as anyone that deposing May now would be folly, especially as not all Brexiters are signed up to his backward vision for Britain, and his getting on the final ballot paper is by no means guaranteed. By way of reminding all and sundry of his existence, so Gavin Williamson gave us a double whammy of interventions too. He immediately tried to steal limelight for himself by declaring he'd had an affair which, if his story was true, is untrue; a couple of snogs hardly puts him on a par with "Shagger" Johnson, but it did allow him to talk about the strength of his marriage drone, drone, drone. That The Graun were planning to do a number on him was another coincidence, But to detract from that story, he decided to reveal intelligence that the Russians have a submersible fleet capable of cutting undersea cabling and piping, which would cause Britain thousands of deaths in the event of war. That his fool move has opened him up to accusations of going public with classified information is entertaining, it nevertheless demonstrates what kind of man Williamson is: someone who will cynically kick up a story to put attention onto himself, and a Tory wedded to the idea of scaring his party's voters into supporting him. Anything approaching a programme beyond personal advancement is entirely absent. Unfortunately, when things get fraught for the Tories, as long as Williamson is near the centre of power he'll intervene and make it all about him. But are we at crisis point for Theresa May yet? As all sides assail her demanding to know what her vision of Brexit is, this plan, if it can be referred to as such, sans the smoke and mirrors is going to satisfy neither the Moggs nor the Soubrys. And yet, yet, there she is, still PM. To coin a phrase, nothing has changed. For all the witterings about confidence letters, everyone knows there is no factional dominance - a Brexiteer would have a hard time holding on to centrist leaning, remain inclining Tories, and a remainer as leader would see the ERG and its friends do as they please. Someone from the middle of this morass would only supplant May to find themselves in an identical position, and who'd want that? Added to that, everyone knows those who wield the knife will have their ambition consumed by the forces they unleash. Jolly old Heseltine for one and, more recently, Angela Eagle's desperate effort to depose Jeremy Corbyn are always helpful reminders. Which means, despite everything said in the press, the rumours of no confidence and what have you, unless a fall guy can be found whose loyalty to principle comes before self-interest (certainly a rare creature in the parliamentary party), nothing will happen. And even if that does occur, the factional balance would mean May wins a vote of confidence, even if the majority of those votes are grudgingly given. Will May be Tory leader a month, two months, six months from now? Unfortunately for her, the odds are in her favour. What makes for a classic video game? You tell me. But typically, when YouTubers draw up their list of favourite games ever, or at the very least throw together a best of re: the beloved Super Nintendo, 1994's Super Metroid is invariably there. What is it that marks this title as an evergreen classic that stands a good chance of getting a play or two a century from now, assuming disaster doesn't befall us and all we hold dear isn't ground into radioactive dust? Let us bolt down the time tunnel and revisit the attributes of an average game. The mundane and the ordinary is a game that isn't broken, but neither is it inspired. It sits firmly within a genre, regurgitates the dominant graphical tropes and conventions, and offers a play experience that might kill some time but fails to leave an impression on neither the critical gatekeepers of gaming, nor on a mass audience. A good game typically introduces interesting mechanics while offering solid playability, and a classic? It has to do all of these, rewrite the rules and redefine gaming in some way. Does Super Metroid do all these things? Yes. For the unacquainted, it immediately presents as a sci-fi action platformer in the mold of so many others. Playing it, however, is another matter. 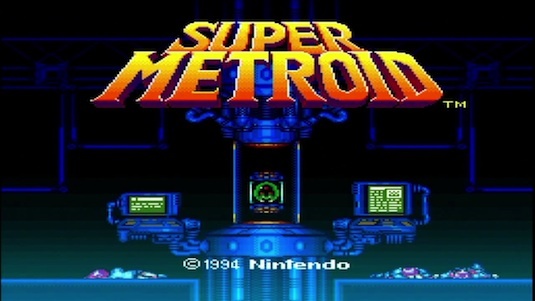 From the pre-game sequence of your brief battle with Ridley the space pirate to your landing on the surface of Zebes, and your initial descent into the bowels of the planet Super Metroid manages to capture something virtually absent in 16-bit video games: atmosphere. When Samus, your player character for the non-cognoscenti, emerges from her ship into a rainstorm and you begin your journey through the tunnels of the planet the sound work does a fantastic job of immersing you into a sense of creeping dread. This has the effect of encouraging a cautious and methodical approach to the game. In its opening hour or so of gameplay you slowly start acquiring abilities that permanently boost Samus's performance - the ability to morph into a ball to access smaller tunnels, better guns, suits that allow you into environmentally hazardous areas, better bombs and missiles, grappling beams, speed boots. It quickly becomes apparent from your automatic map that some rooms have hidden entrances, and there are whole sections of the game world missing, which can only be accessed after the acquisition of the relevant powers. And so realisation dawns that this game is huge and it's going to take a while to get to know it. Here is where Super Metroid comes into its own. The prospect of finding hidden areas and awarding exploration with decent power ups and, in this case, sometimes the ability to progress the game has always been a Nintendo hallmark since Super Mario Brothers. The perfect controls and fair gameplay, despite respawning enemies, means that trudging from one end of the game to another to uncover that secret area you know is there is, well, never a trudge. Because exploration is rewarded with knowledge of shortcuts and power ups, it's a game that eventually confers a sense of mastery; especially when the periodic bosses have been overcome. Playing Super Metroid in 2018 is a worthwhile experience. Because it was a relatively late SNES game the programmers knew well which buttons to push. The look of the game is obviously 16-bit, but its presentation has a timeless, ageless quality to it - a bit like Sonic the Hedgehog's first outing. Likewise the sound is very SNESy with the signature reverb, but does an excellent job of underscoring the loneliness of your quest. And for gamers habituated to single player experiences, the length of the first play through here (which was about 20 hours for me) is a good way to ease oneself gently into the delights of yesteryear - though with the danger that Super Metroid sets a bar so high that nearly all other 16-bit action platformers/adventures fall short. Yet like the classics of film and literature, flaws there are and I'd venture two criticisms I've never seen raised by the gushing reviews and retrospectives. And both have a great deal to do with Nintendo. First, Metroid and its sequels were conceived as Nintendo's gritty franchise, as something less cutesy and more suited to older players. Here it completely falls down. For all the work done to maintain menace in-game, the premise is cheese and your nemesis are "space pirates". Buried in the game you also find cuddly aliens that give you hints about some abilities you have, which are totally out of place. Even the name - Metroid - sounds naff and try hard, and the packaging artwork is too cartoony. Nintendo can and do make compelling gaming experiences, but they still do not know how to do adult. The second is the other perennial problem with the company, their stilted class and gender politics. Samus Aran is the apogee of muscular petit bourgeois sensibilities: the bounty hunter. In its predecessors, she is employed by the Galactic Federation to deal with the space pirates and the eponymous Metroids, but by the time of Super Metroid her mercenary motives give way to charitable altruism as she becomes the sole hope for the galaxy. Her escapades are very much a solitary affair, finding inspiration from and re-inscribing the lone wolf tropes that litter popular culture. Hold on a moment, class politics aside didn't Nintendo actually move with the age by making Metroid's protagonist a woman? Yes, but just as Sigourney Weaver had to do a turn in her underwear in Alien, upon completion of the NES original off comes Samus's suit, leaving her resplendent in 8-bit bikini glory. Unfortunately, it returns here as well. There are three main alternate endings depending on how long it takes the player to complete the game - in the fan community parlance, these range from "bad" to "good". In the bad you have a besuited Samus give you a thumbs up in between the credits. In the intermediate ending, if you complete it in fewer than 10 hours, you get the same again except Samus removes her helmet. And the good ending? She poses in skimpy sportswear once again. It's almost as if Nintendo felt the non-existent need to reassure its mostly male audience that all the derring-do and offing hostiles doesn't mean Samus has stopped being a hottie, that even as an action figure she can still be ogled and appreciated as an example of emphasised femininity. We were later to see this set of logics inform the design and positioning of Tomb Raider's Lara Croft. In Nintendo's case you might put this down to thoughtlessness or programmer laddishness, if it wasn't for the fact their other major franchises - Mario, Zelda - didn't run with tired rescue-the-princess tropes. In sum, a short overview can't do this game justice. The narrative and gender politics don't unduly impact on the playing experience itself. Super Metroid is one of the best designed video games ever and is worth playing any which way you can. This month saw 21,312 votes cast over 10 local authority (tier one and tier two) contests. All percentages are rounded to the nearest single decimal place. Four council seats changed hands in total. For comparison with December's results, see here. We start 2018 not with a bang, but a whimper. In all fairness, this has to be the most boring month of by-elections I've covered in a long time. It started off promising with a gain from the Tories by Labour, which was clawed back in reply during the 18th's round of by-elections. Everywhere else, it was stasis. And, even worse, what action there was took place in safe Conservative seats, hence their being the runaway winners in this month's popular vote. Any take homes? Not really, except these results might suggest Labour is starting to stand in no hope seats thanks to the expanded membership. This is about time. Somehow, by hook and by crook and with a party collapsing around their ears, the Conservatives nearly always scrape together a candidate. In other news, UKIP are still in a bad way - and news now reaches us that the entirety of its council group in Thurrock has gone indie. And yet they still manage a higher polling average than the more numerous and active Greens. Are Momentum Crap at Selections? Well, are they? News Momentum-backed candidates have only achieved success in seven out of 29 selections should give pause for thought to anyone who wants to see the Labour Party transformed. How then are we to make sense of stalled progress in a party dominated by Jeremy Corbyn supporters, and is everything as it immediately appears? Here are some things worth considering. 1. Incumbency. As Alex Nunns notes, a number of seats under selection have prospective candidates who stood in the previous general elections. As anyone who's active in mainstream politics will tell you, the experience of campaigning can strengthen solidarity, friendship and loyalty among those who take part. 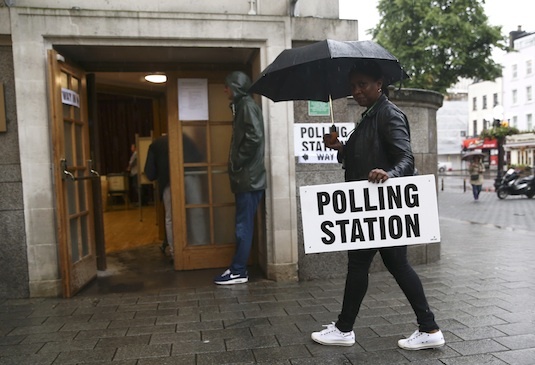 The shared frustration of a rubbish canvassing session, traipsing around rain or shine, the thankless hours printing and folding, this is the stuff of which a strong ties between a local party and a candidate are made. The members get to know the candidate, they can get to appreciate the candidate. So, when selection swings around again, are the members likely to go for the tried and tested and has already proved themselves, or take a chance on someone entirely new? The same dynamics applies for the reselection of sitting MPs, which is why unless someone is stunningly awful - Momentum might not have a list, but plenty of activists have - MPs on the whole have nothing to fear. 2. The eclipse of official machine politics. There was a time the party apparat took a close interest in selections, often at the behest of connected people in London or power brokers in the regions. On a number of occasions and at various times, these very important people were senior party staff. Now and then they would assist a stitch up here, organise a phone around there, tip favoured sons and daughters off about upcoming selections in plum seats, and assist with egregious abuses. Sometimes, Progress-sponsored candidates would benefit from these shady moves. Now? Well, that sort of fixing and favouring is in retreat and Momentum-backed candidates on the whole do not enjoy the bureaucratic leg up many sitting Labour MPs had in getting their selection. Indeed, they're more likely to fall victim to ancien regime hold outs at local selection committee level. 3. A kinder, gentler machine politics. The direct advantage of having the party (unofficially) in your corner has gone, but backing from Momentum should help; what with the huge database that could be mobilised, and the prestige accruing the outfit from its association with Jeremy Corbyn. Yet, apparently, this advantage isn't working. As The Graun report notes, in a number of places local Momentum activists are losing out on endorsements in favour of comrades favoured by Momentum's national committee. This can result in a backlash, of members feeling hard done to and going for local Corbynism over national Corbynism in selection meetings. There was certainly an element of this about last weekend's Stoke-on-Trent South selection, where the Momentum nomination went to London-based barrister Mark McDonald over suspended local councillor Ruth Rosenau and other local Corbyn supporters. On this occasion, Mark prevailed (and I think the members made the right decision) but Momentum candidates elsewhere have not. So while it is a matter for Momentum who it decides to nominate, it should be sensitive to local sensibilities in advance of future selection battles. 4. Inexperience. Momentum, we should remember, is a young organisation with only two-and-a-half years under its belt. It does have members who have undertaken a long apprenticeship in the drafty (and empty) meeting halls of the Labour left, but the bulk of its membership are fresh to the Labour Party and, in a lot of cases, fresh to politics. This means building up skills, learning from the experience of selections won and lost, developing a strong infrastructure that extends into every constituency party, learning how the process of internal struggle - the back scratching, the ego-stroking, the seemingly irrational webs of friendships and alliances that make up constituency parties - are very different from mass canvassing and flash meme production. But with its membership and its well-schooled leadership, I expect this difficulty that will prove fleeting. 5. And have Momentum really lost that many selections? On the face of it, yes. Only seven with the official nod are now PPCs. But take, for example, the selection of Lizzi Collinge in Morecambe and Lunesdale. She won out over Erica Lewis, the nominated Momentum candidate, but is she anti-Corbyn? All the indicators say no. Likewise Cllr Karen Davis, the PPC for Norwich North was not adopted by Momentum but nevertheless is a Jeremy Corbyn supporter and has been since the 2015 leadership contest. How many more of the 29 selected PPCs are, for all intents and purposes, no different than a Momentum candidate? It is quite possible that while the media and our Progress and Labour First friends pat themselves on the back every time a Momentum endorsement doesn't make it, they are failing to notice the left are doing better than they think. Tony and Blair. Two words conjoined guaranteed to draw a sigh of disapproval from, well, nearly everybody. And I regret to record that when it comes to daft things said to the press, he's been at it again. In his interview with the paper of Fleet Street's highest profile editor, Blair doesn't say a great deal. It's all a bit "blah blah New Labour was fine blah blah Corbyn evil blah". Specifically he claims New Labour wasn't neoliberal, and the the Labour Party is in a worse place than was the case with Michael Foot in charge and Militant running around. What interests me is the sense that Blair finds Labour's positioning terrible. As someone long wedded to the delusion of technocratic politics and buoyed by the Macron myth, Blair doesn't think a left wing politics in government is possible. He says, "If you’ve got limited time and resources, is nationalisation the priority? If you’ve got £8 billion a year to spend on education, is abolishing rather than reforming tuition fees the right way, or is early years education, particularly for poorer families?" Note that even now, despite a career in front line politics wedded to, yes, a variant of neoliberal politics, Blair cannot bring himself to criticise the putative actions of a Corbyn government politically. It remains couched in terms of "what works", which justified his love-in with PFIs, light touch regulation, and the other nostrums of neoliberal policy and governance we've come to know well. Then after more chit chat, the interview moves on to Blair's cherished talisman/get out of jail card, the centre ground. He notes that the populist surge is down to the collapse of the "generational promise", the expectation that each generation will do better than its predecessor. There is certainly an an element of truth here, and he recognises centrism has to do better than "trust us, we're the sensibles", though this idea fails to capture the roots of right wing populism. Nevertheless, the place generational promise can be renewed is, yes, in the political centre. He goes on to say with a Labour Party captured by the "hard left" and a Tory Party stained and deranged by Brexit, the centre is frozen out and will find an expression in some way. He is right, but he is oh so wrong. While there is a mass radicalisation of hundreds of thousands switching on to socialist politics in a way not seen for decades, there are many others who are not but are drawn to Labour simply because the remade party is articulating their interests. Not only are we in tune with the outlook of a rising generation of workers, it is the only one taking their concerns seriously. As former universities minister David Willetts put it, " ... the aspirations of these people – they don’t want a Marxist revolution; they’re not voting for a massive transformation of British society – what they’re wanting, actually, I would argue, is classic Tory aspirations. It’s a property-owning democracy." This presents Corbynism a limit and a challenge if it is to be a truly transformative moment in British politics, though it is assisted - at Willetts's own admission - by a Tory party locked into the older vote. But yes, ultimately these are the aspirations Blairist centrism tried and more or less monopolised before the stock market crash wrecked everything. What Blair doesn't get and cannot compute is the party had to move left to capture them. Pale left-leaning centrism doesn't cut it. 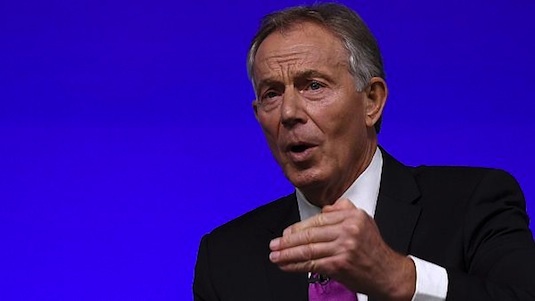 Ultimately, Blair's discombobulation is because his comfort zone doesn't exist any more. Since the war, Parliamentary politics have been dominated by the two big parties, with a cameo of varying duration and influence by the Liberal Democrats and their predecessors. And while there were significant political differences between them there was a continuity of outlooks, of taken for granted assumptions about how the world works and the way government should be run. Before 1979 the Keynesian/welfarist consensus sure a shared approach that was established by the celebrated 1945 Labour administration. After 1979 and particularly following the defeat on the labour movement in the 80s and the shock loss of the 1992 election, it was the Tory-Thatcherite consensus. To all intents and purposes, the three parties were (competing) wings of the same bourgeois party. They protected property rights, they protected profits, they protected the wage relation. With one exception. Labour's politics were on this terrain, but as a party of the labour movement, of the expression of organised proletarians - people who have to sell their ability to labour to earn a living - it was always vulnerable to pressure from below that could potentially threaten the cosy bourgeois consensus. The opening of the 2015 leadership contest and Corbyn's candidacy realised this latent potential. The take over of the Labour Party is the eruption of interests pushed to the margins of official politics, the sorts of interests bourgeois politics want at best want to accommodate and pacify, at worst defeat. That is until they inevitably well up again at another time. 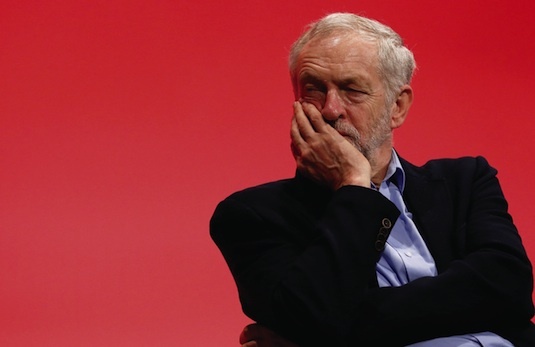 What Corbynism means is, as far as ruling class politics go, the party is lost to them. Beyond a few hold outs in the PLP and in town halls, it has put in stark terms the political vulnerability of capital. It's like the red mole clawing its way out of the concrete tomb Thatcherism had imprisoned it in. Blair and his elite support are paid up members of the ruling class party, albeit the one now utterly marginalised in a Labour Party which, for the first time in its history, is seeing proletarian politics asserted. The dogmatism and bewilderment that has greeted this shattering event, its pathetic expression in the shallow alphabet soup of pro-EU hashtags, the yearning for Macron, the tiresome shenanigans and bad faith briefing, and the totally clueless response of the Tories are the entirely understandable consequence of a politics in crisis, and one not knowing where it's going to end. To nab a line from The Manifesto, for Blairist centrism "all that is holy is profaned, and man is at last compelled to face with sober senses his real conditions of life, and his relations with his kind." And faced with the real state of things, they recoil, invent new fantasies and caress new fetishes - anything but face up to the brute historic fact of their bankruptcy. Unfortunately, there is a market for advertising one's irrelevance. Blair's niche is less a challenge to Corbynism - he has proven singularly incapable of doing that. But he does offer that most powerful of salves: nostalgia. And I'm quite happy for Blair to pop up every few months with his sage words for the dwindling faithful to lap up. It means he and his are leaving the field clear for us to remake Labour politics in our image and in our interests. Love him or loathe him, John McTernan is a useful fella because he's one of the few commentators the Labour right have got who plainly, and sometimes bluntly, states their collective position on an issue. No shilly-shallying, no fudging. That doesn't mean he's right, as his latest piece in outsourcing demonstrates. What John demonstrates is the managerial/technocratic approach to politics as opposed to, um, a political approach to politics. Que? Let's look at his argument. 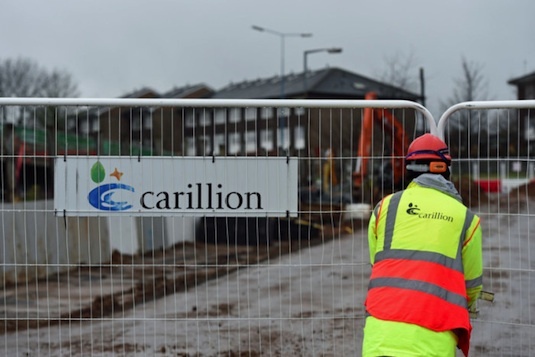 For John, there are three great things about outsourcing to companies like Carillion. Private companies can deliver public services well, the risk of failure is privatised, and public services are delivered cheaply. It doesn't really matter if these companies fail because contracts can be transferred over, shareholder value is lost and we lose a cadre of suits - big deal. As for jobs lost, while this is "disruptive" John points out we are seeing the tightest labour market since the 1970s, the implication being there are opportunities enough out there. The wider point is when you set it against other big government departments that don't practice outsourcing on a huge scale (he cites the Home Office and the bungling of Universal Credit), you have multiple inefficiencies and failure. Contracting out introduces accountability into the system. In its contact with reality, John's argument falls to bits. The claim Private Finance Initiative schemes - the sort Carillion were heavily involved with - are cheaper and better quality is simply not true. According to the National Audit Office, schools and hospitals built using PFI schemes are more expensive than if the state borrowed the cash and built it itself. On accountability, well one might suggest there is a better way to keep companies (and state institutions) honest than market signals, and blatant conflicts of interest. And as for the privatisation of risk, what risk? When the state is a guaranteed customer, where is the risk? Again, as with so many claims made for market efficiencies, they're not based on fact. Indeed, they're refuted by fact. Instead it's supposition, the idea that profit making makes enterprises lean and efficient is stated as if its true, a piece of hocus pocus no amount of corporate failure seems able to dispel. More dangerous, however, is the politics. John treats outsourcing like a management exercise, but it is not. When anything is outsourced to a private provider, they take up the contract because they're in the business of making profits. And this usually means cutting costs. Often, this involves taking on new staff on worse pay and conditions (despite TUPE), skimping on the service provided, using cheaper and shoddier materials, and increasing the casualisation of labour. For example, before my mum retired she was a home help for the county council. In the last couple of years the way she and other workers went about their tasks changed. Out went time to sit with and talk to pensioners receiving the help, and in came the well known (and well reviled) telephone check-in system. As soon as the job was done, she'd ring the number, walk to and ring in at the next client. Meanwhile, the care was partly outsourced to a private provider. The remaining staff were still employed by the council, but new starters were taken on by the company at minimum wage, which was much less than what mum received. For John and the outsourcing cheerleaders, this is fine and dandy. Money saved, yes? No. Lower wages for the new staff meant higher rates of top up via the benefits system. The imposition of clock tyranny brought with it micro management by the providers, which meant higher staff turnover and a diminution of the care ethic. No time to chat to the clients, who were often house-bound elderly people who otherwise see someone once in a blue moon, meant they too were alienated from the care and suffered the consequences of increased loneliness - something the government now pays lip service to. This doesn't save money. For a few thousand here, a few thousand there off the council's care bill we find costs displaced onto social security and, given the rise of mental health problems among the elderly, is no doubt a contributor to the (manufactured) strain on the NHS. And what about the political costs? Outsourcing is absolutely corrosive of the social solidarities the Labour Party depends on. If you're an old person receiving poor quality care from a young woman on the minimum wage, are you likely to feel sympathy with their difficulties? If you're a young woman shuttling from grumbling pensioner to grumbling pensioner for pittance pay, are you going to pay any mind to problems affecting the elderly? It's all very unlikely, isn't it? And neither are going to thank the Labour council ultimately responsible for this state of affairs. Now imagine this writ large. What do you suppose outsourcing has done to our communities? Think about the declining quality of jobs, the casualisation that means Britons have to work longer, on average, than our European counterparts. Think about the atomisation, the fraying of communal bonds at work and in the community decades of these practices are responsible for. That is why, rightly, trade unions and the left are opposed to outsourcing, because it makes life harder and damages our interests, which makes selling our politics that much harder. It should be basic labour movement politics, really. If there is anyone who lays claim to the left and lays claim to the Labour Party while advocating this nonsense, you would be wise to think "with friends like these ...". On Twitter a few weeks back, Cllr Dan Jellyman, cabinet cloak room attendant on Stoke-on-Trent City Council invited me to sign a petition pushed by fellow Tory councillor and MP for Stoke South, Jack Brereton. 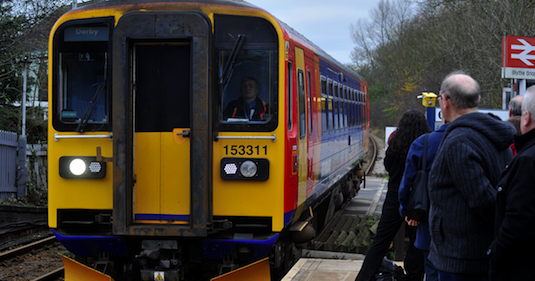 The issue concerns the hourly train service that runs from Crewe to Derby. This also happens to be the train I have the pleasure of commuting to work on nearly every day. The problem with the service is not punctuality (which is nearly always good) but the quality of the stock. More often than not the heating is broken or doesn't work properly, and leaky windows are a persistent annoyance - we're talking torrents here, not the odd drop. However, by far the most egregious problem are the number of carriages. 80% of the time we make do with a single coach. If you can visualise a carriage trundling along the railway you have accurately captured what the service is. Sometimes it's not too bad, but at rush hour it is and if Uttoxeter races are on and the company - East Midlands Trains - have forgot to lay on extra, you're talking dangerous overcrowding. I'm sure any MP would want to see something done if this was the case in their constituency. As a new honourable member, Jack has taken up an issue the hundreds of people who use the route every day are annoyed about. Nevertheless I turned down Cllr Jellyman's request I lend my signature to Jack's petition, and that wasn't because it was being pushed by a Tory MP. It's because things are about to change. Derby train station has started a long overdue remodelling of the lines running in and out. Presently there are bottle necks at both ends that limits the station to the entrance of two trains at each end at any given time, which is a bit of a pain when you consider there are six platforms. It can mean a delay to one service often has major knock-on effect on others, and as far as my train is concerned about half the time we have to pull up and wait outside the station for another service to clear the points. By the end of the summer this will be cleared, meaning a cut down in delays as trains no longer have to criss-cross the lines. Also, according to a number of rail workers of my acquaintance, the Crewe-Derby service is due a revamp with extra rolling stock added to it, and the roll out for this is scheduled for around the time the Derby work is completed. Which brings us back to Jack's petition. He's had coverage on local radio and the local press, and has got the backing of Chris Grayling. Yet it's all a complete waste of time because the extra carriages he is petitioning for are happening anyway. This begs a couple of questions. Is Jack ignorant of the changes to the service, which is worrying considering his old portfolio at the City Council covered transport. Or are we talking about a cynical stunt in which a song and dance now can be built up into a famous victory party later when the rolling stock is increased? Are we seeing ignorance or cynicism? I'll leave you to be the judge. The Last Days of the Conservative Party? What is the Brexit Stamp Collection?